Curated by Joanna De Vos and Melania Rossi, working alongside Art Director Sergio Risaliti, the “Spiritual Guards” exhibition was unveiled on March 15 and will run through October 2, 2016. 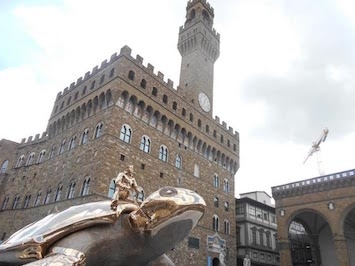 Palazzo Vecchio, Firenze’s city hall, is also displaying a series of Fabre's sculptures, connected with various frescoes and artifacts preserved in the Hall of Justice, the apartments of Eleonora, and the Hall of Lilies. In addition to the sculptures, a large globe coated in beetle shells is on display, aiming to be viewed in relation to Ignazio Danti's famous globe in the Hall of Maps. In May, the exhibition was expanded to Forte di Belvedere, where 60 works in bronze and wax will be on display, along with films highlighting Fabre’s past performances. Born in 1958, Jan Fabre has distinguished himself as a multidisciplinary artist; he has produced works as a playwright, stage director, choreographer, designer, painter, and sculptor. He is known for exploring the relationship between drawing and sculpture, producing works in various mediums. In one of his most famous works, he covered an entire building with ballpoint ‘Bic-art’ drawings. Another ground breaking work was his decoration of the ceiling of the Royal Palace in Brussels with 1.6 million jewel-scarab wing cases. In 2004, he erected Totem, a giant bug stuck on a 70-foot steel needle, on the Ladeuzeplein in Leuven. Those traveling to Florence before October will be fortunate enough to see his work displayed in the streets. For the latest travel tips to Italy, stay tuned to the Italian Concierge!